New mods can be put here with the game name at the beginning. Specifiy what game it is for and give reasonable instructions on how to install it. With the crazy new update that brings more features in, Like custom Soundtracks, I decided to hop on the train, And to get each soundtrack from every game in. Link is down below after the images. I am Excluding P8 and PG. 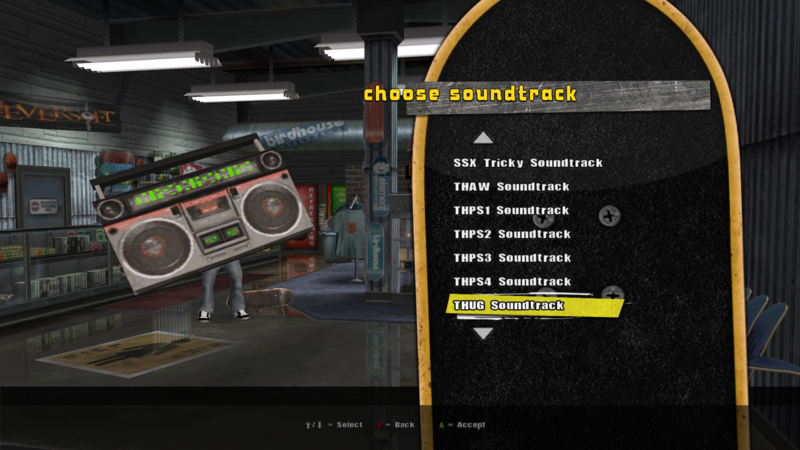 I also do other soundtracks, Like SSX. TAKE NOTE, I DO UPDATE THIS LIST SOMETIMES, BUT WITH THE INCOMING REQUESTS, I WILL BE UPDATING THIS THREAD DAILY! IF YOU HAVE ANY REQUESTS, PLEASE DO SEND THEM IN THE COMMENTS! WHAT THE SOUNDTRACKS WILL INCLUDE, EACH IMG IS IN ORDER FROM THE LIST. EXCLUDING THUG 2, I DID NOT SHOW OFF THE WHOLE THAW LISt OR THUG 1 LIST, BUT THEY ARE ALL THERE. The Gateway into having all of these soundtracks! Last edited by Rdup222 on Fri Jun 29, 2018 2:19 am, edited 2 times in total. Ill see your problem. If you come near me on discord, Ill make sure to DM you. Hello, I think this is a really awesome thing but the problem is that I can't seem to download it because the google drive link doesn't seem to actually exist from some reason. Rdup222 wrote: With the crazy new update that brings more features in, Like custom Soundtracks, I decided to hop on the train, And to get each soundtrack from every game in. Link is down below after the images. I am Excluding P8 and PG. I also do other soundtracks, Like SSX. TAKE NOTE, I DO UPDATE THIS LIST SOMETIMES, BUT WITH THE INCOMING REQUESTS, I WILL BE UPDATING THIS THREAD DAILY! IF YOU HAVE ANY REQUESTS, PLEASE DO SEND THEM IN THE COMMENTS! Looks like you are missing the download links for Jet Set Radio, SSX 2000, SSX 3, SSX Tricky, THAW, THPS, THPS3, THPS4, and THUG. I can only download the THPS2 soundtrack. And the link for Google Drive has been expired!